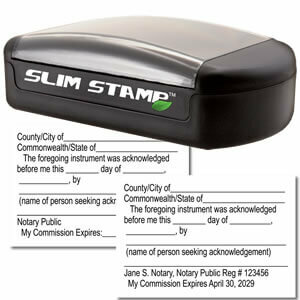 Slim stamps are some of the best products available for notaries. This premium Slim Acknowledgment is a must-have for the traveling notary public. Designed to be sleek and portable, you can easily slip this stamp into a brief case, purse or even a pocket. This stamp is always ready to be used and works in a press-and-print manner. You will love the clean impression this Slim Acknowledgment stamp will give you every time it is used. This pre-inked Slim Acknowledgment stamp is not only convenient to use and carry, but also virtually silent as opposed to a self-inking stamp. Unsure if the Slim Acknowledgment Stamp is the correct product for you? Contact us! An acknowledgment stamp may not be required by your state but it is an important and helpful stamp to have. For notaries who have done an acknowledgment notarization before, they know all too well the amount of wording and documentation they must hand-write after confirming the signature. With our Slim Acknowledgment stamp, you can receive a completely unblemished impression of that special wording with just a press to the page. Just simply fill in the personalized information in the blanks per your document after completing all other notarial requirements and your acknowledgment notarization is complete! Eco-friendly and cost-effective choice - never purchase a replacement ink pad again!